If you’ve never considered a Divers watch, there has never been a better time to find one and in fact you are spoilt for choice. I estimate there are around 20 or so that are really great buys and probably the best “daily beaters” around and a great alternative to the resin cased “shock” styles that seem to be everywhere. And these guys have shied away from tricky to read digital displays and opted instead for what I call the basics – Clear dials, big luminous hands and markers, and near perfect readability, day or night – and they are very tough indeed. Absolutely no question here as this model tops everything I’ve tried and on every level (I’m not talking here of “True Professional” Dive watches with depth meters and logs and so on – just the everyday Diver daily beater). This is the Apeks 200 AP0406 Mens Professional Diver, named and sold by the Apeks Diving Company and one of their best sellers – and I can see why. Easy to read analogue dial, large luminous markers and hands. Tested to 200 metres Water Resistance. Tough compact Stainless steel case with Screw Down Crown. 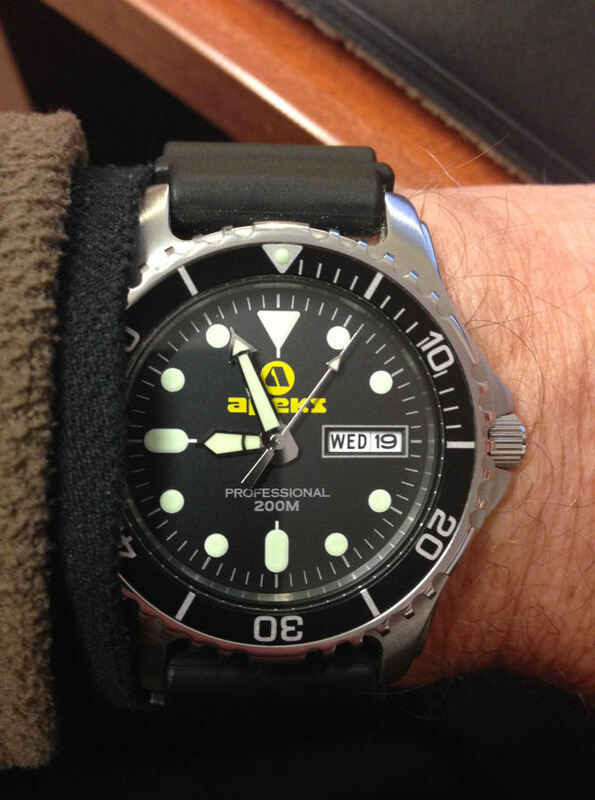 Large uni-directional bezel for dive timing. Very reliable Seiko VX43/3 Quartz movement (note VX42 has no Day/Date) & SR927SW battery. A readable day and date window @3 (not a requirement but nice if you have it). 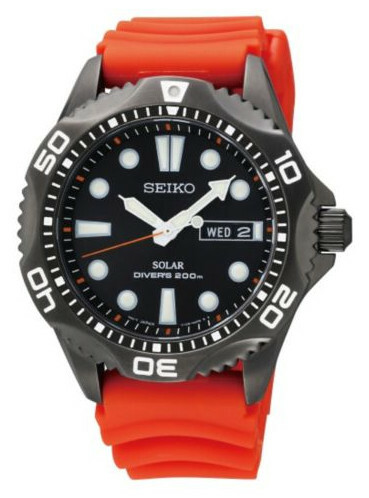 Actually a choice of 3 model versions here – basically it the Seiko Solar Quartz Scuba Diver Sports SNE107P2 black dial or the same priced Seiko Solar SNE109 with a pale Orange dial or perhaps the slightly more expensive (discounted) Solar SNE245P9, the latter probably being my choice if looking for a Solar Diver. Seiko Solar Diver SNE245P9 in black dial and case. Depending on the version these can be picked up from £100 to £170 mark. These models again are very clear and easy to read, great Lumibrite hands and markers with indented lume marker @12 on the uni-directional bezel. They feature the V158 Calibre Solar Seiko quartz movement and has the Day and Date @3in a decent sized aperture. The V158 Solar movement manages around 10 months on full charge, which is approximately 9 hours of sunlight and whilst not an exact figure gives an indication of Solar capacity. A 30mm Hardlex crystal sits in a 45mm (incl crown) x 12mm depth stainless case which is either polished and brushed stainless steel finish or in the case of the SNE245P9 features Ion Plated black stainless steel. All are depth rated at 200m Water Resistance. And there’s no question these models score very highly with folks and the fact they are Solar means no battery worries – ever. Note – The supplied rubber straps (red on the SNE245P9) maybe ideal for wearing over a neoprene wet suit, but often the rubber “wave” grips are too aggressive for long periods on my wrist, so a change of strap may be worth thinking about. No problem in doing so with standard lug spring bars of course and certainly not a negative any means, but maybe a point to consider. I like the idea of the ion Plated model as it’s a bit different to most of my stainless Divers – so my choice this time is for the Seiko SNE245P9. Contrasting the black steel case is a bright red rubber strap and it can be got for around £170 but perhaps discontinued now so IF you can get one at a decent price then it represents very good value. On the other hand if stainless is OK for you and not too shiny then the SNE107P2 is probably the best value/price option, as other than the finish the models are identical as indeed is the Orange dial version. 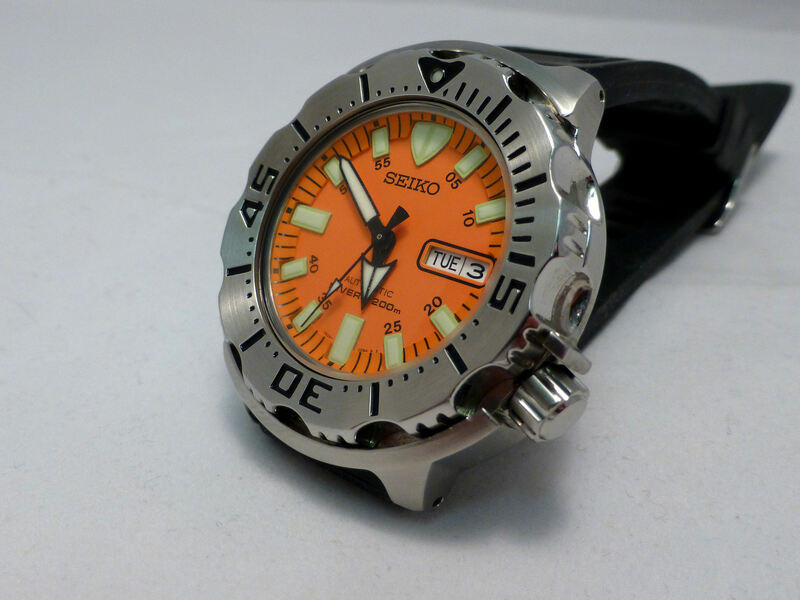 It has to be the Seiko Orange Monster – looks big but wears small and a fabulous watch in every way. With it’s 21 jewel Seiko 7S26 Auto it is a tried and tested ultra reliable movement plus 200m Water Resistance – difficult to beat at any price. And I’ve seen them for under £150 in the UK and even cheaper if you look really hard and with it’s amazing asymmetrical case and overall design it’s a Seiko classic. 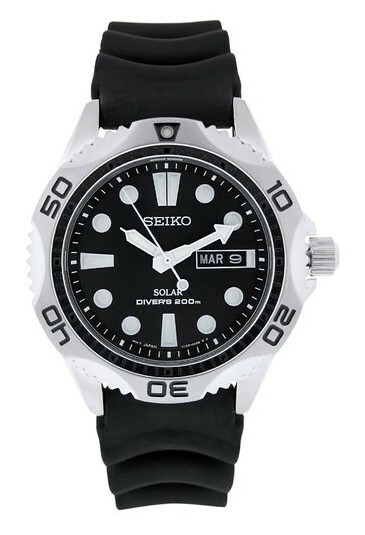 Again there are many other Divers watches that give very good value, though for an Auto mechanical from such as Seiko, this has to be great value and it’s just that bit different.